If you just can't deal with the fuel bills of a Durango as it is now, you might want to wait a year. A Hybrid model, with fuel economy gains of up to 40 percent and a still-impressive tow rating of 6,000 pounds, goes on sale for the 2009 model year. 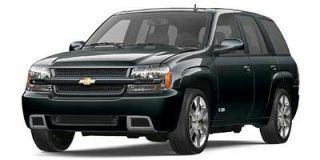 If you plan to tow, a 2008 Dodge Durango with a V-8 will work nearly as well as a Tahoe or Expedition, at a lower price. In the process of assembling this review on the 2008 Dodge Durango, TheCarConnection.com gathered information from some of the best review sources. Then TheCarConnection.com's editors incorporated their own experience driving the Durango to create the most useful review possible. 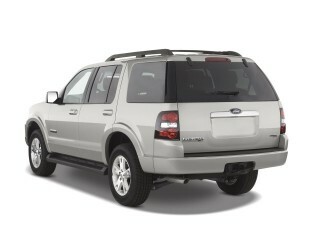 The 2008 Dodge Durango is just a half-step smaller than full-size SUVs like the Chevrolet Tahoe. The Durango was restyled for 2007, with a host of new features, including standard 20-inch wheels for both SLT and Limited trim levels. The standard engine on the 2008 Dodge Durango remains the 210-horsepower, 3.7-liter V-6. A new version of Chrysler's 4.7-liter V-8 is available, with 303 hp and flex-fuel capability. The 5.7-liter HEMI V-8 returns as the Durango's top powerplant, offering 330 hp and 375 pound-feet of torque. The V-8 engines are mated to a five-speed automatic transmission, but the V-6 gets a four-speed automatic. HEMI V-8 versions get the Multi-Displacement System (MDS), which helps improve fuel economy when coasting or cruising--so the three engines get very similar fuel economy of less than 20 mpg, even on the open road. With either of the V-8 engines, the 2008 Dodge Durango is quite responsive, but with a curb weight of more than 5,000 pounds, it's neither especially fast nor nimble. The suspension is quite soft, bringing good ride comfort, though it can be a bit bouncy and queasy on twisty roads; in following, there's a lot of nosedive under hard braking. Inside, the 2008 Dodge Durango is well designed, with reasonably stylish but simple instrument-panel design and good seating for those in the first two rows. Third-row seating, for a capacity of seven or eight in total, is optional. Altogether, the Durango can offer up to 102.4 cubic feet of cargo volume and has a max tow rating of 8,950 pounds. With four different trims--SXT, SLT, Adventurer, and Limited--and rear- or four-wheel drive available on each, the 2008 Dodge Durango spans a wide range of prices and included features. Top Limited models include leather heated seats, a parking-sensor system, power adjustable pedals, dual-zone climate control, LED flood lamps, and a premium sound system with Sirius Satellite Radio. Options on the 2008 Dodge Durango include second-row heated seats, a backseat DVD system, and the MyGIG hard-drive music storage system. For 2008, Dodge adds 18-inch wheels as an option on the SXT, more chrome trim on the Limited edition, and a second-row reclining seat is a new option on the SLT and Adventurer models. Side-curtain airbags, electronic stability control, and anti-lock brakes are now standard across the Durango model line. The 2008 Dodge Durango hasn't been recently tested by the insurance industry, and the federal government has only tested it for frontal impact, where it received top five-star ratings for the driver and passenger. The 2008 Dodge Durango's styling makes an impression--in a big, hulking way. You'll either love or hate the 2008 Dodge Durango's looks, if the opinions of reviewers from across the Web are any indication. Cars.com points out this 2008 Dodge's "short front and rear overhangs, a dramatically sloped windshield and what Dodge calls 'powerful' wheel arches" that give it a "broad-shouldered presence." 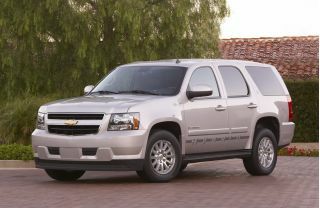 Several sources consulted by TheCarConnection.com use the typical masculine adjectives for the 2008 Dodge Durango. Automotive.com calls it "Big and brawny...forceful expression...the look of a big-rig truck." They also say that history buffs who remember the U.S. Army's T-214 4x4 truck of World War II--also built by Dodge--may note a resemblance between that and this Dodge. Mother Proof agrees on this 2008 Dodge's similarity to a "big rig," but suggests that such a likeness is not necessarily a plus. This source comments that the 2008 Dodge goes beyond the "big-rig" look, taking more after a railroad boxcar. Interior "details are carefully thought out," says Automotive.com, adding that "instrumentation is clean, handsome, easy to read and easy to operate...simple and utilitarian." According to Cars.com, 2008 Dodge Durango "SLT models have standard YES Essentials seat fabric that Dodge says is stain-resistant." The only other specific comment comes from Kelley Blue Book: "The handsome dash is clean, simple." The best 2008 Dodge Durango is the one powered by the 5.7-liter V-8 engine, but it’s thirsty. The 2008 Dodge Durango provides a good amount of power--as long as you get the biggest engine. The standard engine on the 2008 Dodge Durango remains the 210-horsepower, 3.7-liter V-6. A new version of Chrysler's 4.7-liter V-8 is available, with 303 hp and flex-fuel capability. The 5.7-liter HEMI V-8 returns as the Durango's top powerplant, offering 330 hp and 375 pound-feet of torque. Automotive.com reports "both V8 engines are good choices but for overall power, cost, and fuel economy we'd opt for the 5.7-liter Hemi." According to this source, the V-6 can barely get this hulk moving, and its fuel consumption is about the same as the next engine up, a 4.7-liter V-8. However, the 5.7-liter V-8 provides substantially more power at about the same cost in terms of fuel, thanks largely to the 2008 Dodge Multi-Displacement System, which allows this engine to run on four cylinders at cruise speeds. The 5.7-liter HEMI is not the be-all and end-all, according to Cars.com: "Response from the Hemi V-8 is less vigorous than expected." Edmunds also recommends the largest engine: "When equipped with the powerful Hemi V8, the 2008 Durango is one of the quickest SUVs available for the money." A "four-speed automatic transmission teams with the V-6, but V-8 models drive a five-speed automatic," reports Cars.com, adding this 2008 Dodge can cart "up to 8,950 pounds of towing capacity when properly equipped." "For more serious off-roaders, an available two-speed transfer case features shift-on-the-fly capability between locked high-range or low-range modes," says Edmunds. 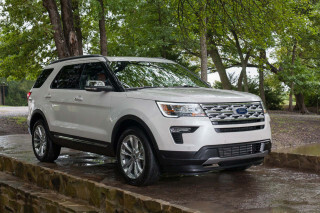 Of course, these engines are thirsty, but there doesn't seem to be a lot of difference between them: EPA-estimated mileage is rated at 14 mpg city/19 mpg highway for 2WD models equipped with the 3.7-liter V-6, while 13/18 mpg is the estimate for 4WD trucks running a 5.7-liter HEMI V-8. Edmunds suggests "the new-generation 4.7-liter V8 is expected to have fuel economy similar to the Hemi." 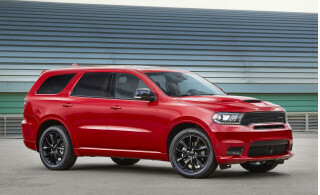 Obviously, when you have a nearly 5,000-pound vehicle, you want plenty of stopping power–-which, according to Automotive.com, is exactly what you get with this Dodge; 2008’s Durango has "big vented discs with twin-piston calipers in front, just the thing for holding back this heavy beast." With anti-lock and electronic force distribution, the brakes have "straight and true" stopping from 70 mph in repeated tests. Handling, though, is a little less confident. Cars.com cites handling problems; this Dodge 2008 "is a little too inclined to edge out of its lane." ConsumerGuide confirms this impression, reporting that the 2008 Dodge Durango "reacts slowly in quick changes of direction." On the other hand, "The steering is pretty impressive for a vehicle of this size, with good response and feedback that allow the driver to make exact lane changes and easily negotiate tight turns," reports Kelley Blue Book. Edmunds says "in spite of its large size, the 2008 Dodge Durango delivers a satisfying balance between a smooth, composed ride and crisp handling through corners," adding that "four-wheel-drive versions are also quite capable off-road, offering plenty of wheel travel and responsive manners." On the other hand, Mother Proof declares that it "doesn't like corners, and it really doesn't like it when I go off my driveway's curb at a bit of an angle," also noting that "head-bonks against the window were reported by numerous passengers." The 2008 Dodge Durango's interior is smaller than its rivals, while interior quality is lower. TheCarConnection.com notes some mixed reactions to 2008 Dodge Durango comfort levels. Cars.com reports the Durango "can hold up to seven occupants when equipped with three rows of seats," adding that a "five-person configuration is also offered." ConsumerGuide says that Dodge 2008 "headroom and legroom are generous, even beneath the housing of the optional sunroof. It's easy to find a comfortable driving position." Automotive.com says these 2008 Dodge "front seats are comfortable, neither too soft nor too firm." The middle-row seats are fine, but in the similar Chrysler Aspen, ConsumerGuide complains that at best, the "3rd row...can accommodate adults for short trips." Cars.com reports "cargo volume behind the third row is 19 cubic feet," growing to "102.4 cubic feet when both rear seats are folded down." 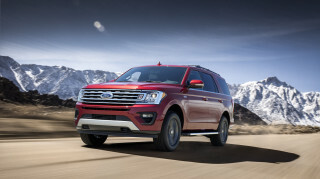 According to Cars.com, the identical cargo area in the Chrysler Aspen (also sharing the Durango body) is "a bit less than the Ford Expedition and Chevy Tahoe, which both have around 110 cubic feet." ConsumerGuide adds "liftover is relatively low, and the tailgate opens at floor level for easy loading...[with] plenty of in-cabin storage, including a deep center console and useful console tray." Edmunds was not nearly so impressed with this Dodge's interior quality, describing a "subpar fit and finish inside." Mother Proof reports that ergonomics are somewhat lacking as well, particularly when it comes to ingress and egress: "I had to seriously duck to get in the cabin...I always wound up either grazing my head on the doorjamb or just plain making a sloppy entrance." 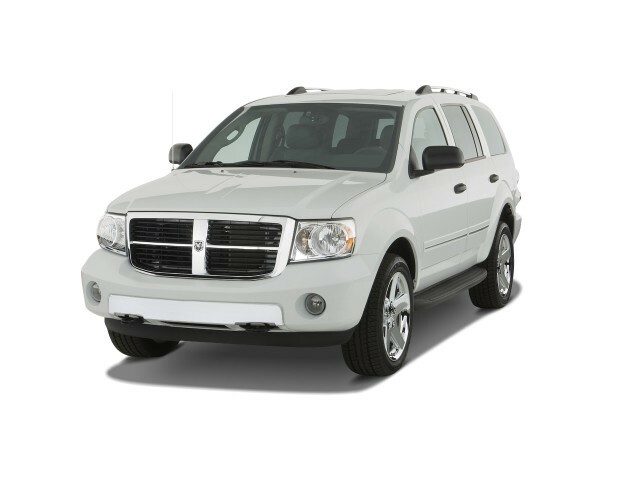 ConsumerGuide is carefully neutral here: 2008 Dodge Durango "cabin materials are neither fancy nor exceptionally cheap looking...despite some lightweight plastic pieces, most everything appears durable and looks appropriate for the price." ConsumerGuide also notes reasonable noise levels for this Dodge 2008: "engines are quiet at idle and growl under acceleration...no noticeable tire whine." The 2008 Dodge Durango scores well in crash tests, but visibility isn’t perfect and rollover ratings are typical for SUVs: low. The 2008 Dodge Durango definitely gets better-than-average marks for safety. In crash tests from the National Highway Traffic Safety Administration (NHTSA), the 2008 Dodge Durango earned a full five stars in both driver-side and passenger-side front impact protection. For 2WD rollover resistance, however, the Dodge 2008 rated only three stars; adding 4WD brings it up to four stars. The NHTSA did not perform side-impact crash tests on the 2008 Dodge Durango. The Insurance Institute for Highway Safety (IIHS) did not perform any tests on the 2008 Dodge. According to Edmunds, "Four-wheel antilock disc brakes...are standard on all Dodge Durangos." Cars.com notes that the Dodge 2008 Durango comes standard with "an electronic stability system and roll-sensing side curtain airbags that protect occupants in all rows of seats." Kelley Blue Book also mentions child door locks and an engine immobilizer. There are also some visibility problems. Although there are generous rearview mirrors, ConsumerGuide reports that 2008 Dodge "thick front pillars obstruct the view around corners." Mother Proof expresses appreciation for the 2008 Dodge backup camera "because I couldn't see a darn thing out of this behemoth." With navigation and Bluetooth, the 2008 Dodge Durango SXT is more advanced than some SUVs. 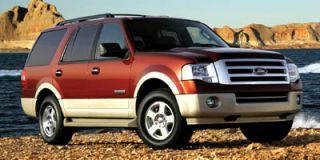 As is often the case, auto experts at TheCarConnection.com note that what you get on the 2008 Dodge Durango depends on how much you're willing to pay. Automotive.com reports that "the 2008 Dodge Durango is offered in four models: SXT, SLT, Adventurer, and Limited." Each of these 2008 Dodge models "is available with two-wheel drive or all-wheel drive." Standard equipment on this 2008 Dodge base model includes "include front air conditioning, tilt steering wheel, cruise control, cloth upholstery, front bucket seats, 40/20/40 folding second-row seat, heated power folding mirrors, power windows, power door locks, remote keyless entry, four-speaker AM/FM/CD/MP3 stereo, cargo cover, theft-deterrent system, rear privacy glass and roof rails." Automotive.com also notes a Technology Group for the SXT “includes a six-disc CD changer, Sirius Satellite radio, remote engine starting, and laminated side glass." Yet another 2008 Dodge option is singled out at Cars.com, which says "a backup camera option is also new." "The midlevel SLT is better-equipped, more upgradeable and the preferred choice for many buyers," contends Edmunds; "Other major Durango options include a navigation system, power sunroof, Bluetooth connectivity, heated rear seats and rear-seat DVD entertainment."